The sale price does not include how much more Canadians will pay to finish twinning the pipeline between Alberta and British Columbia. Finance Minister Bill Morneau won't say how much Ottawa expects to spend on construction because he fears that would affect negotiations with construction contractors which are now underway. The $7.4 billion construction cost Kinder Morgan reported in February 2017 hasn't been updated since the project hit political snags, construction delays and opposition in B.C. 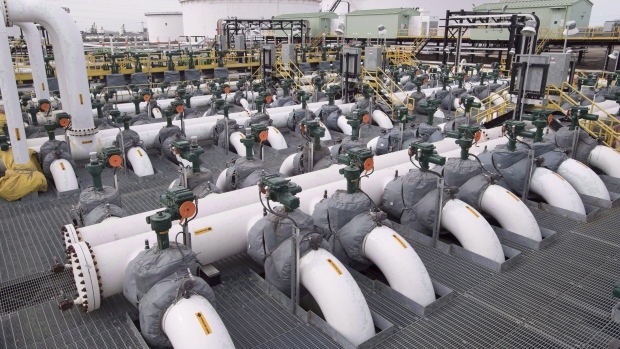 The first update of any kind came Tuesday when Kinder Morgan filed required documents as the company gears up for a shareholder vote on the sale in Calgary on August 30. In those pages, the company looks at a few different construction cost scenarios as part of a fairness evaluation of the sale offer to the Canadian government. The most expensive scenario pegs construction costs at $9.3 billion, taking until December 2021 to complete -- a full year after the current timetable of December 2020. The government was quick to point out the figure is not an official cost forecast. An official in Morneau's department, speaking on background because he was not authorized to speak publicly, said the numbers do not specifically reflect the government's expectation of what the final project cost will be. However Robyn Allan, an independent economist and former CEO of the Insurance Corporation of British Columbia, said Kinder Morgan wouldn't evaluate the fairness of the sale based on numbers that have no bearing on reality. Allan, who said she has expertise on a number of multibillion infrastructure projects, believes in the end $9.3 billion will seem like a steal compared to the final price tag. "This is the least it's going to cost," said Allan. She said the biggest frustration is the lack of information coming from the federal government about the planned sale. Prime Minister Justin Trudeau has staked the legacy of his government in part on being able to protect the environment without impeding Canada's resource-based economy, and building this particular pipeline has become the symbol of whether that's possible. The government stepped in to buy the pipeline in May after the company's investors grew jittery that political opposition in B.C. would mean it never gets built. Although Canada approved construction in 2016, B.C. Premier John Horgan is trying to get judicial authority to restrict what can flow in the pipeline, and that uncertainty led Kinder Morgan to want to bail on the whole thing. Allan said the only detailed information Canadians have about the particulars of the sale is due to investor laws in the United States and Canada that require Kinder Morgan to file documents outlining the specifics of the deal. Since taxpayers are the shareholders of the project now, she said Canadians deserve the same level of disclosure from Ottawa and they aren't getting it. B.C. New Democrat MP Nathan Cullen is equally frustrated, going so far as to call the government dishonest about the deal. "It's frustrating, it's really, really frustrating that at their core has been a murky and dishonest transaction with so much money involved," he said. "I worry about what we're going to get stuck with." Morneau's official said as soon as construction contracts are in place the government will freely release an official cost update, which he said should happen no later than next winter. The initial goal to finalize the sale in August has been delayed until September or October pending the Aug. 30 shareholder vote results.